Retreating Monsoon thunderstorms got the better of Western and southern Maharashtra again on Wednesday evening. As the cumulo nimbus clouds developed, a superbly conducive atmosphere around the region made massive thunder heads rise to 18 kms above sea level, and created an internal 2 level basis within the clouds to ignite lightning within the cloud system itself. Developing west 200 mb jet streams inter-acting with the "departing" SE jet winds, cause massive thunder reactions during a withdrawing monsoon. Massive storms rolled towards Mumbai by the evening, and resulted in heavy precipitation in many parts of the city. Extreme lightning and deafening thunder shook the city. 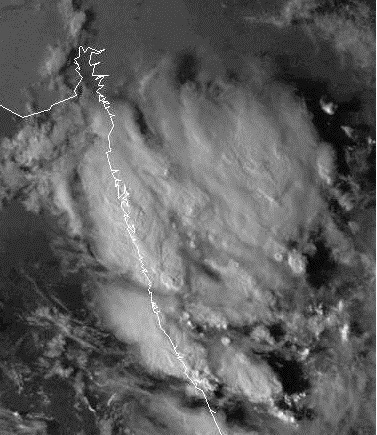 By evening, upto 8.30 pm, SantaCruz measured 59 mms and Colaba 32 mms. south Mumbai at my residence, 44 mms were measured till 9.30 pm. Yes, this has taken the author by surprise. If, we had been waiting for this thunderstorm farewell since 25th September, and it happens, after all the monsoon "settings" are over and done with, definitely it is a surprise and was not expected today. Not in Mumbai, but restricted to South Konkan and South Mah. svt: Please note while reading the wundermaps, these are up graded at 12.30 pm, 6.30pm and 12.30am IST everyday. Not every hour. See home video here and here. Latest 3D image taken @5.40pm Wednesday of the Mumbai coast and interior Mah. nice pic. visual image in setting sun always gives nice 3D effect. Wundermap now showing even heavier rain for konkan, ghats, madhya maharashtra. I will be brave & will say some places in mumbai might get more than 20mm of rains or may be even 30mm. it is pouring out here in deonar...for the past 45 min or so..
@svt i can say your prediction is true,,,,its is raining damn heavily at panvel and the environment is truly electric with roaring thunder and lots of lightening!!! !i dint expect this rain as i thought like yesterday panvel would receive heavy drizzle,,,but the thunder nd lightening with drizzles wich has started from 4 pm has graduated into really heavy thundershower,,,lets see the figures tomorow!!! @Junaid Thanks. :) but really not a single weather forecast model expected this kind of rain. Only around 4 pm wundermap started showing rain all around Mumbai & they upgraded rain around 6pm to even heavier. Only @Rajesh can explain this phenomenon best. Looks like rain will stop in next 30 mins. Some areas of Mumbai must have got over 30mm of rains. @junaid/svt if u go back to ur memories u may c such rain in interior mah, ghats not freq in mumbai, acc imd mumbai doesnt receive any rain in oct 2007, and highest is 136mm in 1996, similarly pune got 179mm last oct i don't know whether u agree or nt but my point is weather is seasonal. pavan: 2007 oct was dry,u r right, 2009 saw 158 mms at colaba and 223 mms at scruz. wettest october at colaba was in 1917, when the month had 507 mms. I had a front seat view of the storm today at Juhu / Vile Parle from 7:00 pm till 11:00 pm as was out with family for dinner. The storm just went insane from 8:00 pm till 9:30 pm, non stop lightning with deafining thunder, getting stuck in the traffic and watching all that around was not amusing at all!! As pointed out by a few readers, all models got this completely wrong. The GFS in it's 12:00 UTC forecast still shows no rain for Mumbai for today!! By the way it is still raining here at 11:30 PM oscilating between light to moderate rain showers. If SCZ was 59 mms till 8:30 PM as pointed out by Rajesh, it must be around 70 mms by now. If one were to believe the GFS forecasts, rain and T'showers are forecasted for Mumbai for another week. The Mumbai Meteogram mentions of the lifted Index going up to -6!! this weekend. What are we to expect then? Even more severe storms? Rajesh, sitting here in Kerala I feel the forecast for Kerala has also gone awry, my conclusion is that the E-W trough in South India aligned itself a bit norther than expected leading to Mumbai also getting enveloped.